It’s a beautiful day in Bikini Bottom, and SpongeBob SquarePants is just waking up, bright-eyed and confident. Today is the day that he will be promoted to Manager of the Krusty Krab 2. For those of you who don’t watch Nickelodeon on U.S. television, SpongeBob is the star of a successful cartoon series featuring quirky creatures that live, work and annoy one another at the bottom of the sea. The game I’m describing is based on the recent movie release: The SpongeBob SquarePants Movie. Since the movie and the game are aimed at a younger audience, I have chosen to play and review this game with my eight-year-old son Deanie (his choice of pen name). Deanie’s comments will appear in bold italics. And Behind Door Number One We Find: An Adventure Game! 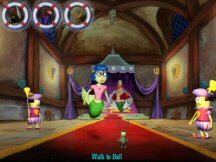 Unlike other recent games based on hit movies, the PC game inspired by The SpongeBob SquarePants Movie (hereinafter the SB Movie Game) is a traditional adventure game in just about every possible way. It has an engaging story, lots of dialog-based character interaction, inventory challenges, sequencing challenges, a point-and-click interface, and a save system so rational that (after playing other movie-based games) it will make you weep from sheer relief. There is no leaping, climbing, or shooting –nothing that remotely resembles athleticism. The purity of the SB Movie game’s adventure gaming character is only slightly sullied by three easy arcade sequences. There are even a couple of throwaway references to the Kings Quest and Zork games, which may indicate where the designers’ instincts were leading them. The SB Movie game is a third person perspective game in which you play as four different characters: SpongeBob, Patrick (a starfish), Plankton (a microscopic sea organism -- possibly a sea louse) and Mindy, a mermaid princess. SpongeBob is the most endearing of these characters, with his relentless optimism, his rapid fire popgun laugh, and his talent with a spatula. He resembles a bright yellow scrubbing sponge more than a sea sponge. SpongeBob is cool because he’s so silly. He starts the game in his UNDERPANTS! Plankton is one of the more complex characters in Bikini Bottom, a Napoleon of the ocean floor. He compensates for his small stature by embracing a super-sized ambition to take over the world. He has no friends and is married to a snidely-voiced computer named Karen. Plankton has a tendency to talk to himself. A typical self-comment: “If only my intellect could be made flesh! I would be unstoppable!” Plankton is mean, angry and evil. He’s not crazy though. The game takes place in eight chapters. After each game portion, you are taken to a photograph album called “The Quest for the Crown,” where a narrator explains the advancing plot. This works well for the most part, though sometimes so much of the plot is covered by the photograph album that the story feels a bit choppy. Although the game does involve a quest for a crown, it also is a journey of self-discovery. SpongeBob is not only trying to save his world, but also striving to become a man. The question of what he must do to become a grown-up – one that is respected by other grown-ups – is variously explored in the game, from the awarding of mustaches to the dangerous visions in the Corridors of Confusion. Why does SpongeBob want to be a man? I think so he can play games that are “T” for Teen. In many ways, the game is perfectly geared for an adult and child playing together. The puzzles are easy enough to be solved by a child (I’d estimate they are aimed at ages six to ten) with occasional help from an adult. The inventory is easy to use – clicking on items in the environments causes the item to glow against a shiny blue background, then the item inserts itself into a life preserver near the top of the screen. Right-clicking brings up the item in its preserver, and you drag and drop it right where you wish it to go. If you’ve observed a child playing the Freddi Fish or Pajama Sam games, I would place the difficulty level smack dab between those two. The game was really easy, except when I was stuck. There are also sight gags – many related to the game’s underwater setting – and even an elevator music sound gag. Like the best classic cartoons, this game entertains at a child’s level while the dialog and aspects of the plot entertain at a far more advanced level. If you set aside the ease of its puzzles, in many ways the game is ageless. The graphics in the game are taken straight from the cartoon show. They are bright, colorful, 2D and cartoon-like. The sea background looks like a Hawaiian shirt fabric. Buildings are unusual: SpongeBob’s neighborhood features a house shaped like a pineapple, a house shaped like an Easter Island statue and a house shaped like a giant rock. The environments are pleasant to look at, though the exterior locations don’t always have a lot of detail. The exteriors are animated, though, with rippling light reflections, bubbles, and seaweed and sea cucumbers moving with the current. Interiors are more intricate, but there are usually only one or two items per screen that are hot. Characters are three dimensional; their movements and facial expressions are somewhat stylized. But then you wouldn’t expect a sponge or a starfish to move with unusual fluidity (or to emote with extraordinary subtlety). Left-clicking moves the characters to the next screen – there is no 360 degree panning. When you double-click, Sponge Bob trots, Plankton runs, Patrick bounces and Mindy’s tailfin undulates at double-time. One feature I enjoyed is that when you click on a hotspot, the characters often comment without first trudging all the way across the screen to take a look. This aided the pacing of the game and (in a game that isn’t exactly realistic anyway) I thought it was a nice touch. The game features many cutscenes. These are easily distinguishable because the viewing area shifts to letterbox format. The quality of cutscenes is identical to that of the regular graphics; transitions are extremely smooth…. Impressive. Special kudos go to Tom Kenny as SpongeBob, and Mr. Lawrence as Plankton. The actors who voiced the Hotel Deep Six manager and Octavio are also worthy of mention (though they aren’t identified in the credits). The ambient sounds are serviceable. They are mostly of the watery/bubbly variety. Background music is cartoonish – cheerfully corny in some locations, dramatic and exaggerated in others -- almost tongue-in-cheek. No, definitely tongue-in-cheek. Load times between levels are several seconds long. Also, you cannot click through the dialog or the cutscenes, so there will inevitably be times in the game where you sit through a repeat of something you’ve already seen. Final “annoyance”: I swore to myself that if I found a game that did NOT resort to using sliding tile puzzles, frustrating timed sequences, complicated mazes, difficult arcade sequences or stealth sequences to extend gameplay, I would never, EVER complain that the game was too short. Well, the SB Movie Game contains none of the aforementioned hair-pulling game extenders. So I won’t complain. I feel I got more than my money’s worth. I just wish there was more of this delightful game to enjoy. Now, aren’t there more SpongeBob games out there? Could they possibly be as good as this one? Deanie and I had a wonderful time with this game. Almost as much fun as WANTED: A Wild Western Adventure. (Coming from Deanie, this is high praise indeed.) Then we reached the end. At the close of the game, our heroes return to Bikini Bottom, and the place is changed. This is where Deanie’s infectious enjoyment abruptly ceased. In short, the change in Bikini Bottom terrified him. I suspect that this is a quirky reaction. The changes struck me as being mildly silly and not particularly threatening. But I feel I need to mention it in case other children have the same reaction. You’d think that an eight-year-old who has slain hundreds of orcs atop the walls of Helms Deep would not be frightened by the situation in Bikini Bottom. But Deanie certainly was. It’s scary at the end with the chum buckets. If you don’t happen to run screaming from the computer, you will find that the game’s ending is entertaining and satisfying. A traditional adventure featuring the wacky characters from the SpongeBob SquarePants cartoon. Point-and-click interface, third person perspective. Bright, cartoon-like graphics. Engaging story, funny dialog with puns and wordplay, terrific voice acting. You cannot die in the game. Inventory and sequencing puzzles, three mild arcade-like challenges. Overall difficulty level: very easy. No sliding tile puzzles, no sound puzzles, one easy maze. Unlimited save slots. No glitches or stability problems. Long load times between levels. You can’t click through dialog or cutscenes, so you will encounter some annoying repetitiveness. The SpongeBob SquarePants Movie is aimed at children, fans of the SpongeBob cartoons, and adventure gamers who enjoy whimsical characters and silly wordplay. As a family game for adults and children to play together, it is almost perfect.